The most important day in the Christian calendar is fast approaching and given the amount of creativity that goes into making this one day the most fun especially for kids, isn’t a joke. Yes, we are talking about Easter that falls on 20th of April of this year. For those who don’t know the history behind why Easter is celebrated, here is just a brief about it – ‘Easter celebrates the resurrection of Jesus three days after he was crucified and it is preceded by a 40 day period of fasting, prayer and penance’. That’s for the more serious part but how did the bunny and colorful eggs come into play on Easter? Well, the Easter bunny is actually a fantasy character (just like Santa Claus) that brings gifts, candies and toys for the children the night before the Easter day and gives them to the good and obedient children (now that’s positive reinforcement for what is considered good behavior). And the eggs? Well, it’s just how Christians celebrate new life (considering Jesus came back from the dead) as eggs are a symbol of fertility. The focus of Easter may be on the sweets but what a lot of us ignore is the fact that we are at the liberty of choosing whether or not we have to include in our kids’ basket all the sugary goodness. And for kids, make a colorful and creative anything and they’ll be more than happy to accept it. 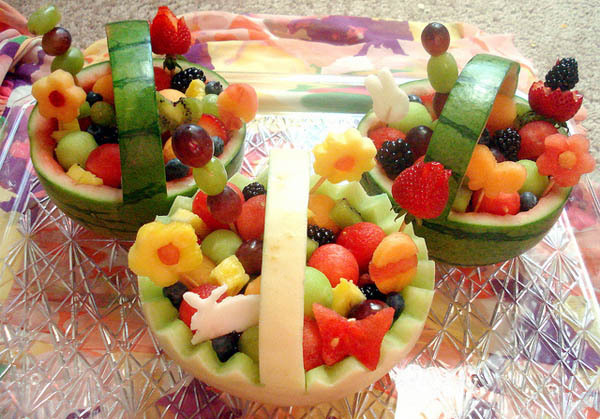 So for all those mommies who think health is all supreme when it comes to their kids, go for a combination of fruits like apples in various colors, bananas, grapes and the like and decorate them with as you wish (to make them more appealing for the kids). What do rabbits eat? Carrots (Remember – ‘Eh! What’s up doc?’?) And what better way for the kids to eat vegetables that are both nutritious to eat and cute to look at (we are referring to baby carrots)? Having carrots in your kids’ basket will not only make it diverse but also healthier. A handy videogame or card game whatever you think fits is another great idea for the kids, arcade games would do too but you’ll have to make sure that the game you have chosen fits the basket (if it doesn’t then you’ll have to create or buy a bigger basket which means all the more goodies for the kiddies (oh boy!). Now which kid doesn’t like art supplies? Colored markers, crayons, color pencils, stencils, glue… the list goes on, anything that fires up their brain’s artistic and creative part. The art supplies can set off a whole different world for your kids to realize what their creative mind is capable of doing. So art supplies are a great go-getter. Oh you know the look on your kids’ faces when they are disappointed when they don’t get the much awaited or expected candy? We’re sure you do. So we won’t disappoint them this time. 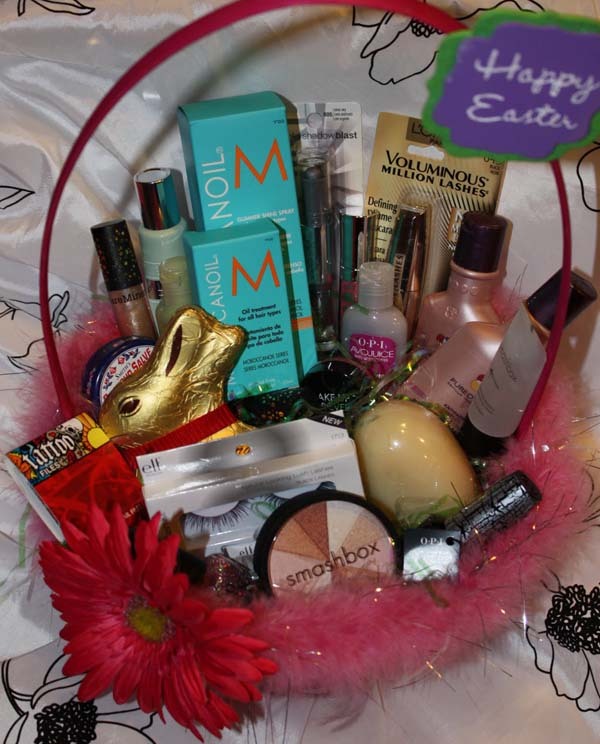 Their Easter basket has to contain something sweet if not everything sweet. Some candy for the little ones, please. Toys, toys and some more toys. You can never enough of buying toys for your little one just because they are cute and because you love that smile on your toddler’s face when he plays with something he feels is out of the world, even if it is just some decorative hung on his crib. Considering how helpful and useful tactile things are for toddlers, giving them pieces of art and crafts should be one of the first things on your Easter basket list. But please ensure that the art and craft supplies can be used by the toddler your toddler’s age. We are talking about cute little hair accessories with a tiny hand bag if it’s a girl and the ones like sunglasses, a hat etc. if it’s a boy. And please don’t forget to take pictures when you dress up your toddlers in those accessories (we might as well die of cuteness). We know how much our little ones love the idea of bathing with little squiggly toys. For little bit more fun, throw in some colorful letters and numbers and if you are still teaching your toddler numbers and letters of the alphabets, you might as well make bathing a learning activity for him the next time with this addition to the Easter basket. Depending upon how old your toddler is, you can always add a water bottle or sipping cup (of course colorful). If the cups or bottles are visually appealing, your toddler will drink just about any health drink you want him to drink. If the teenagers in question here are girls, then what better than giving them with a makeup kit/bag with some makeup in it. How about some liners and kohl pencils to start with if you feel your teenage daughter is ready to wear it all? Throw in some basic makeup brushes and a few products to use them with. Talking about teenage boys, just like girls can never have enough of makeup and the girly stuff, boys can never have enough of gadgets, which must be quite apparent from the likes of your teenage son, yes? So if you think your boys have been overly obedient and they deserve a gadget, make sure you give at least something that they have been wanting for a while now. 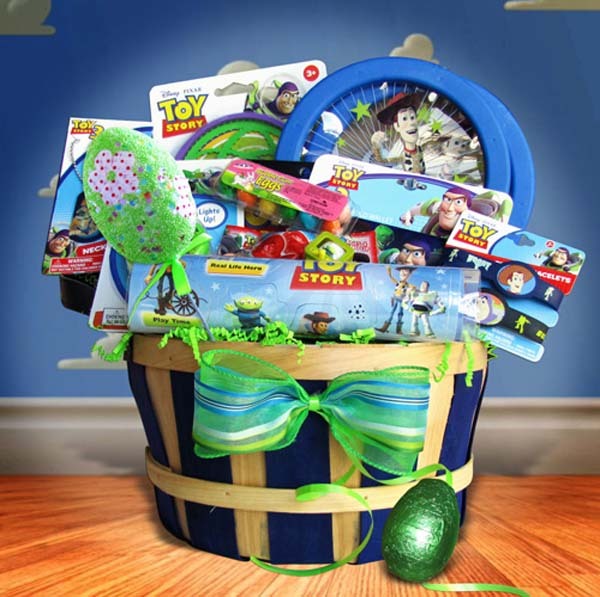 A shopping spree may not be what your teenager be really into (not yet), but they’ll love even the thought of receiving toys in their Easter basket. Whether it is a graphic tee or cute little bunny socks, they’ll love a piece of (in)expensive clothing to add to their spring wardrobe. Books are one item that goes well for an Easter basket for a kid, a toddler, teenager, adults and everyone alike. Depending upon the choice of your teenager, as in which genre they prefer, add a nice read to the basket. So you’ll know they are spending their free time in doing something great (reading that is). You can’t, really can’t, go wrong with chocolates. Teenagers and chocolates are a match made in heaven (or so we like to believe). And when an Easter basket isn’t complete without a chocolate, you might as well invest in a chocolates piece or two for your teenager (just make sure with all the sugar rush, your teen doesn’t develop a zit the next day). When we say toys, we really mean outdoor toys like a basketball, a football or anything of that sort. Considering how much boys love sports, so throwing in a ball or two would do them good, real good. If they’re more of staying indoor type (although we don’t encourage that), gift them an arcade game that happens to be a mind game at the same time. If your boy is a little on the younger side, then put in character-themed movies or know his preference in terms of cartoons he watched, and give him an entire DVD based on his favorite cartoon character. Otherwise, he would definitely have a superhero he looks up to, you know which DVD you have to look for. Just like a girl wear her mommy’s makeup candidly, in the same way a boy wears his dad’s cologne or deodorant when he’s not around. Give him a chance to use his very own cologne spray if you are open to the idea and let him know that he’s old enough to use the same (only if he is that is). Pretty cool idea for your boy right? Why giving a wallet is a good idea is kids should be allowed to take their own financial decisions at times and when they have a wallet, for one, they can be sensible enough to know they have to keep the money at the right place. And who knows they might want to lend a hand with the house work to earn more pocket money to fill that wallet. If your boy is a lover of music and possesses an iPod or two, give him some rocking headphones to go with it. Or better yet, an iPod or any other music player if he doesn’t own it already. 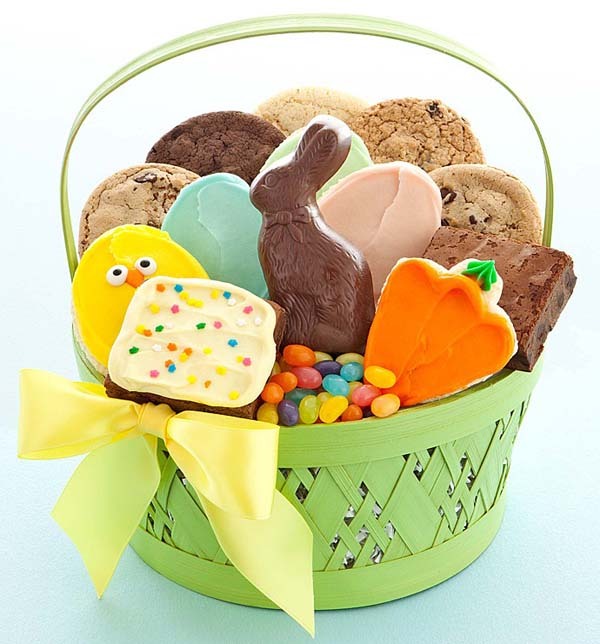 Everyone loves the idea of cookies in an Easter basket. And of course when you have to make it yourself at home, you have the option of deciding how much sugar you want in it. Pretty cool, right? Moreover, to make cookie baking more fun, you can ask your kids to give you a hand and make different shapes out of them. Get some colorful ribbons and fabric and make some bows out of them. If you don’t know how to make them, take help of the plethora of tutorials on-line. Your kids can further use those bows for putting them on a gift wrap later on in the future. Sock bunnies: You know the bunnies we make out of socks? Yes, those. Make some and throw them in the Easter basket and have fun with your kids later playing with those sock bunnies. Be prepared for a round of laughter with the silly jokes they’ll crack. 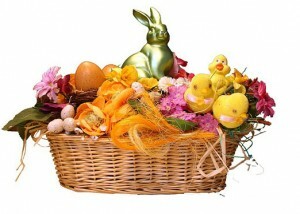 making an Easter basket at home is a good idea in itself. If you don’t know how to weave a basket (which most of us don’t), then simply take a shoe box and wrap it in a wrapping sheet, add a sturdy handle to it and decorate with colorful and appealing things and you are good to go. If you have a little more time at hand, then creating a photo frame from scratch would be a wonderful home-made Easter basket idea. Better yet, put a picture of your kids and their friends together and we are sure they’ll cherish it for a long time to come. So these are a few ideas that we put together to make Easter more fun for you and your kids alike. We hope some of these ideas come in handy for you if not all. We would love to hear about what you have to say about these ideas and if you have your own ideas to share, please don’t forget to mention that below in comments. Have a happy and fun-filled Easter!